Yometa was a comparison search engine, it started in 2011. 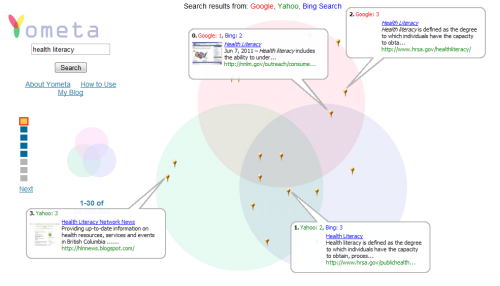 The goal of Yometa was to compare the hits of the search engines Google, Yahoo and Bing. The first 22 hits of each search engine were displayed in three intersecting circles. This shows which results appear in two or all three search engines. The website itself is still online, but the results are no longer displayed. Phil Bradley (2011): »To search a term, simply type in a search term in the top left entry box and click the search button. The top 22 results will be displayed as pins on the three intersecting circles. The top 4 results (as determined by the Yometa algorithm) among these 22 pins will display in the form of bubbles with website information, linked to the pin location. To search among the remaining Yometa first page results, simply hover your mouse over the squares on the far left side of the screen. Website bubbles will display over every 4 results in a sequential manner. To display the next set of results, i.e, results 23-44, press the “next” link at the bottom of the set of blue squares. To display any combination of results from the three search engines, simply click on the appropriate section of smaller set of intersecting circles on the left side of the screen. For example, if you want to see only the results shared by all the three engines Google(red), Yahoo(green), and Bing(blue), you would click on the center portion of the small intersecting circle.